The United States isn’t the only country with an odd tradition for predicting the weather. That tradition is a ground hog named Punxsutawney Phil. 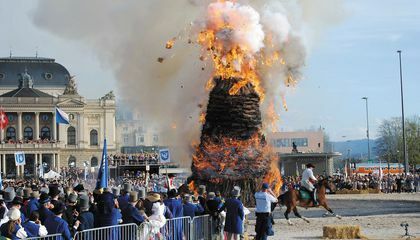 But in Zürich, Switzerland, the locals turn to the Böögg. It is an 11-foot-tall snowman. It is stuffed with straw and cotton. It is also stuffed with dynamite. But it is not like Punxsutawney Phil. It does not look for its shadow. Instead, folks gather in the town square to cheer when the Böögg is engulfed in flames. The belief is that the sooner the Böögg’s head explodes, the closer the townspeople are to spring. The zany tradition is part of Sechseläuten. It is an annual spring festival that dates back to the 16th century. It translates to “the six-o-clock ringing of the bells.” Long ago, craftsmen would work in their guilds. They’d work until the sun set around 5 p.m. That was during winter. Things changed during summer, though. With more daylight hours, the workday ended at 6 p.m.. To announce the first day of spring, the city council would ring the largest church bells. They were in the town square. By 1902, the burning of the Böögg was introduced. Eventually the two events merged into one giant festival. It includes a parade of the craft guilds. They are a system founded in the 14th century. It divided craftsmen into group by specialty. This included blacksmithing and baking. This year’s event will be April 8. 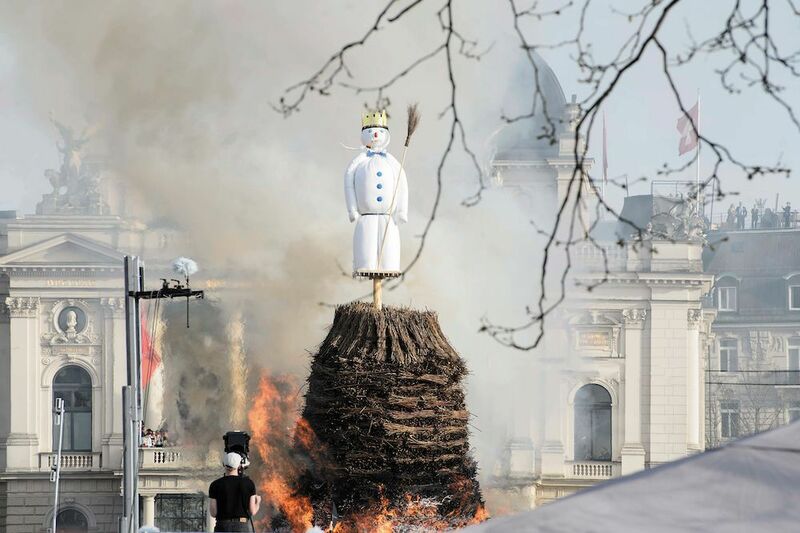 It ends with the burning of the Böögg. “[The bonfire] is a symbol of the burning of winter.” That's according to Victor Rosser. He is the head of communications for the Central Committee of the Guilds of Zurich. It is the organization that helps plan the festival. To say goodbye to winter’s chill, thousands of locals and visitors flock to Sechseläutenplatz. It is the town square. They gather to see the explosive spectacle. Some people even place bets on how long it will take for the stuffed snowman's head to explode. One of the festival's weirder moments took place in 2006, when a group of “leftwing militants” stole the Böögg. They stole it out of the builder’s garage. They replaced it with a chocolate Easter bunny and a hammer and sickle. Heinz Wahrenberger is a bookbinder who assembled the Böögg for 50 years. He had to come up with a plan B. He outsmarted any would-be thieves by creating two backup Bööggs. Today, one sits on display at the local bank. It is a prelude to the festival. “Thankfully, the Böögg wasn’t loaded with fireworks when it was stolen,” Rosser says. Stolen snowmen aside, the Sechseläuten that is perhaps best remembered by locals was the year that the Böögg’s head fell off. It happened while it was engulfed in flames. Not missing a beat, a group of people at the front of the crowd picked it up. They threw it back into the bonfire before it exploded. It was a spectacular prelude to spring. What surprised you most about this tradition? Why? Wow exploding a snowman to predict the weather. That is so interesting. I never would think that blowing up a showman would predict the weather but I guess it can. What was most surprising to me was that they would blow up a snowman head to see if spring is coming soon or not .It's interesting how a lot of countries have different traditions to find out if springs coming or not. I don't think these predictions are right. My question is why it's called a snowman and it's not even a SNOW man. I also think the article is pretty cool. This is a very weird tradition. I think it's weirder than groundhog day. I think it’s actually really interesting that they use an exploding snowman instead of a ground hog. It would be cool to travel there and watch it all happen. This is a very creative idea to predict spring. I would love to see this in my city as well. Also, it's kind of funny how they decided to do a snowman being blown up instead of something else because you don't really see snowmen being blown up often. Do you? I was very surprised by the tradition, since I had not heard of it, but the idea of ? ?an explosive doll is good, the second that surprised me was when they picked up the doll's head when it fell to the ground before it exploded. because it could have caused an accident if at the moment the people grabbed it, it would have exploded.